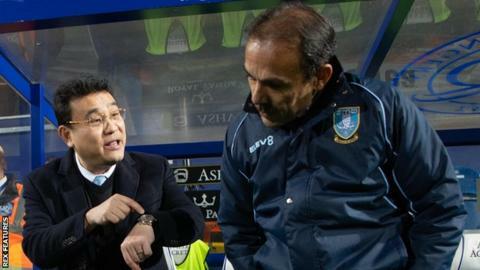 Sheffield Wednesday owner Dejphon Chansiri says he is putting the Championship club up for sale. The Thai businessman, who bought the Owls in 2015, told a fans' forum he would put the club on the market. The Owls are currently 18th in the Championship, with fans unhappy with manager Jos Luhukay, and were under a transfer embargo which ended in August. "I will put this club on the market. I believe many people want to buy," Chansiri told the forum. Chansiri bought the club from former Portsmouth and Leicester City owner Milan Mandaric almost four years ago. But recently then the club has seen problems off the field, with the Owls placed under a transfer embargo between April and August this year after breaching Financial Fair Play (FFP) rules. Under the English Football League's profitability and sustainability rules clubs are not allowed to post losses in excess of £39m over three years without punishment. The last available financial figures show the Owls lost more than £20m in 2016-17, an increase of £15m on the previous year. Wednesday made just one permanent signing and two loan signings before the transfer window closed at the end of August. "The EFL changed the regulations at the end of last season. We didn't just break (FFP rules) a little, we broke them a lot - eight figures," he added to the forum. "We have problems with FFP, so it is hard, but we will try our best. "I am not looking to next season, I am looking now to solve FFP and how we can make this season as good as we can. "If we can solve those problems now, then next season can be better." "The Sheffield Wednesday fans forum was at times heated which is understandable given the recent performances of the team. "An emotional Chansiri then saved the most striking bit until last in announcing that he'd listen to offers for the club; A surprise move but not a total shock as there'd been rumours of talks in the background for a month or so. "Both sides gave as good as they got in the debate about various issues, not least the future of the manager Jos Luhukay, but with other points more questions were left than answers."